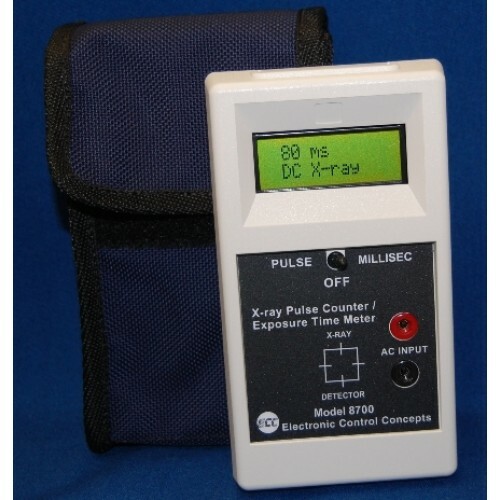 The Model 8700 X-Ray Pulse Counter/ Exposure Time Meter is used to measure the time or duration of radiation output produced by a wide variety of x-ray generators. The x-ray sensor in the 8700 allows direct measurement of exposure from the x-ray head. Pulses produced by half wave and full- wave x-ray are measured as 60 or 120 pulses per second. 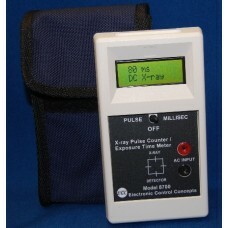 For DC, capacitor discharge and 3-phase x-ray, the 8700 measures the exposure time in milliseconds. 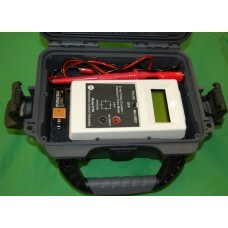 When testing x-ray timers and controls, the time of relay contact can be measured using the AC input feature. The Model 8700 is "self-resetting". There is no need to reset the instrument after each reading. The reading is stored after each exposure, holding until the next exposure. Measurement ends at 70% of peak value eliminating inaccuracy due to slow tail. Digital / microprocessor circuitry does not drift or lose accuracy over time. New circuitry saves production time and parts cost, allowing us to keep our competitive prices. Low power circuitry improves battery life.